When my sister was ill a couple of weeks ago, with symptons of food poisoning – I told her to make up a cucumber-lemon water as she was extremely dehydrated. It helped within a day and she liked it so much she has been drinking it ever since. 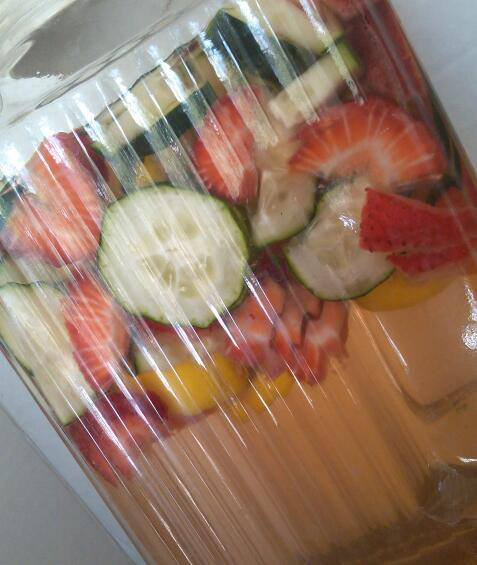 The picture above is what I made up yesterday, with the addition of strawberrys using purified water, cucumbers and lemon I poured a large glass and then refilled the container up to the top with water. I added a small packet of natural sweetener and it is quite tasty. The cucumbers really stand out in the mix. We will be into the 100’s tomorrow in Phoenix – and it’s going to be a long hot summer. I drink alot of water in a day – and this is so refreshing and a nice change. It’s a great drink for the kids as you can mix it up (see link below) with pineapple, oranges – use your imagination to create great, natural products.